Sisyrinchium chilense Hook., Bot. Mag. 54: t. 2786 (1827). Sisyrinchium ramosum var. chilense (Hook.) Herb., Edwards's Bot. Reg. 29(Misc. ): 84 (1843). Bermudiana chilensis (Hook.) Kuntze, Revis. Gen. Pl. 2: 699 (1891). Bermudiana bermudiana var. chilensis (Hook.) Kuntze, Revis. Gen. Pl. 3(3): 306 (1898), not validly publ. Sisyrinchium graminifolium Bertero ex Steud., Nomencl. Bot., ed. 2, 2: 596 (1841), not validly publ. Sisyrinchium uniflorum Gay ex Phil., Linnaea 29: 63 (1858). 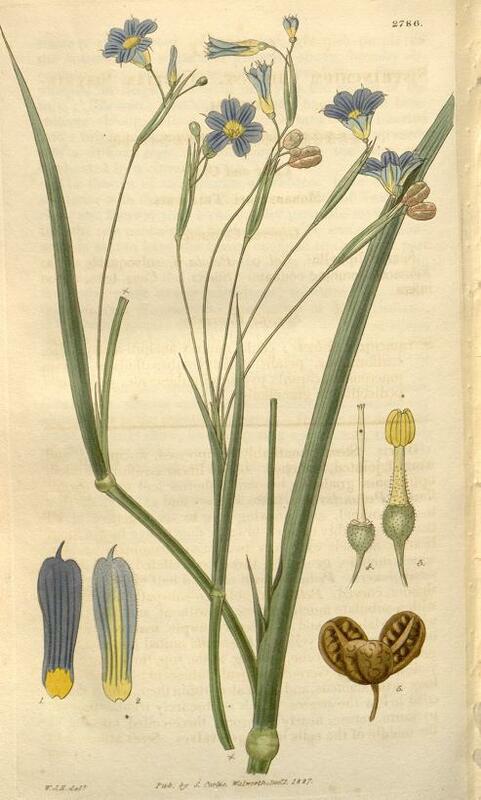 Sisyrinchium quinquevulnerum Dombey ex Klatt in C.F.P.von Martius & auct. suc. (eds. ), Fl. Bras. 3(1): 536 (1871). Sisyrinchium berteroi Steud. ex Baker, J. Linn. Soc., Bot. 16: 117 (1877). Sisyrinchium valdivianum Phil., Anales Univ. Chile 91: 616 (1895). Bermudiana bermudiana f. coerulea Kuntze, Revis. Gen. Pl. 3(3): 307 (1898), not validly publ. Bermudiana bermudiana f. flavida Kuntze, Revis. Gen. Pl. 3(3): 307 (1898), not validly publ. Bermudiana bermudiana f. lactea Kuntze, Revis. Gen. Pl. 3(3): 306 (1898), not validly publ. Bermudiana bermudiana f. lilacina Kuntze, Revis. Gen. Pl. 3(3): 305 (1898), not validly publ. Bermudiana bermudiana f. rubra Kuntze, Rev. Gen. Pl. 3: 305 (1898), not validly publ. Bermudiana bermudiana f. violacea Kuntze, Rev. Gen. Pl. 3: 305 (1898), not validly publ. Sisyrinchium vulgare Herter, Revista Sudamer. Bot. 7: 203 (1943). Sisyrinchium herrerae Vargas, Revista Univ. (Cuzco) 33(87): 175 (1944 publ. 1945). Sisyrinchium chilense var. urubambense Vargas, Bol. Mus. Hist. Nat. "Javier Prado" 8: 217 (1944). Sisyrinchium chilense var. uniflorum L.U.Molina, Anales Fac. Química y Farmacia, Univ. Chile 20: 182 (1968), no basionym or Latin descr. Sisyrinchium chilense var. uniflorum (Gay ex Phil.) L.E.Navas & Urra, Anales Fac. Química y Farmacia, Univ. Chile 20: 182 (1968). Sisyrinchium iridifolium subsp. valdivianum (Phil.) Ravenna, Bonplandia (Corrientes) 2: 286 (1968). Sisyrinchium micranthum subsp. valdivianum (Phil.) Ravenna, Onira 5: 60 (2001).